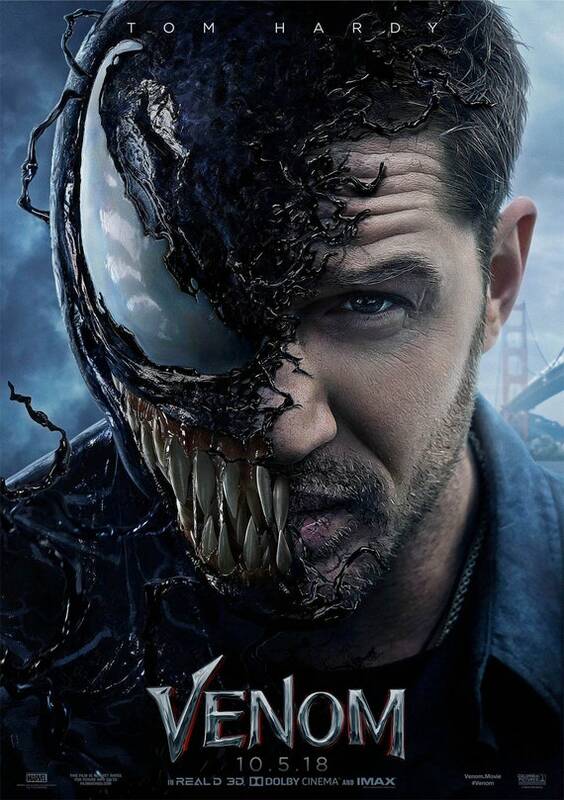 Venom follows a talented Tom Hardy's Eddie Brock as he struggles to juggle his life after a flesh-craving anarchic alien attaches itself to him, takes control of his life, and begins to cause mayhem on its path to nobody knows what or where, which makes the villain's unpredictability even more of a thrilling aspect to look forward to in this film. Venom is Sony's heads-up to what they plan to do with their own cinematic universe, run counter to Marvel's MCU, Fox's X-verse and Warner Bros. Worlds of DC (fomerly, DCEU). Having had up to 20 movies from the MCU alone thus far, it's expected that any film that serves the comic book genre will be eyed to fit into the molds that MCU movies have long created. According to MCU standard, superhero movies are supposed to be fun, light-hearted and full of colour accompanied by things-that-go-boom. Venom is grimmy, gritty and embraces many genres, with its most isolating and prevalent being horror; body horror at that. I can see why most fans of the genre would be put off by a mouthy, dark and downright contrasting film from what they're used to. Heck, even the MCU's most darkest film, The Winter Soldier, is all glitzy and filled with splendour and is more action-focused than anything. Venom challenges the quo the same way the DCEU has been brutally criticised for. So, it's no surprise that this movie is getting so much slack from critics for daring to not be the colourful, joyride it should be, what with its association to Marvel and all. Listen, Venom is good. It transcends what is expected from a film of an otherwise assumed whimsical genre, and that's the only reason its Google searches are as negative as they've been. Though, there is a rare time where audiences come together to revolt against critic consensus, and I'm glad its happening for this movie because it would be a shame if most people didn't go out there to watch it amidst the negative reviews. As a film, Venom is thematically and tonally apt. It knows what story it's trying to sell and it sells it to its utmost ability. It might be a mash-up of genres, from comedy, to romance, to horror, but it is better for it. The film's chaotic tones match up to Venom himself as he proves erratic and overly-eagerly. Every film, and filmmaker, should be able to be itself without the qualities of previous films of a shared genre being super-imposed on it. The worst thing about Venom is that it won't be discussed, or even watched by some, in the manner it deserves because MCU movies have saturated the genre so much that it'll take a while before audiences, especially critics, accept that films in the same genre can vary in tone and themes and still be good without being compared. Honestly, superhero movies don't have to be mindless entertainment all the damn time. If I haven't said it clearly enough, Venom is a burst of genre collisions and a revolution-initiator, standing alongside the DCEU, for the new age of superhero/villain movies, and it is bloody fantastic for it! The film is worth every bit of your time; you'll leave the theaters satisfied if you go in with an open mind, and anything Marvel far from mind.